This is the work-in-progress website of the :F server family and mod for the Q3 clone game called OpenArena as you surely know, that's why you are here. The server is located in Frankfurt with a superb low latency connection for european players. 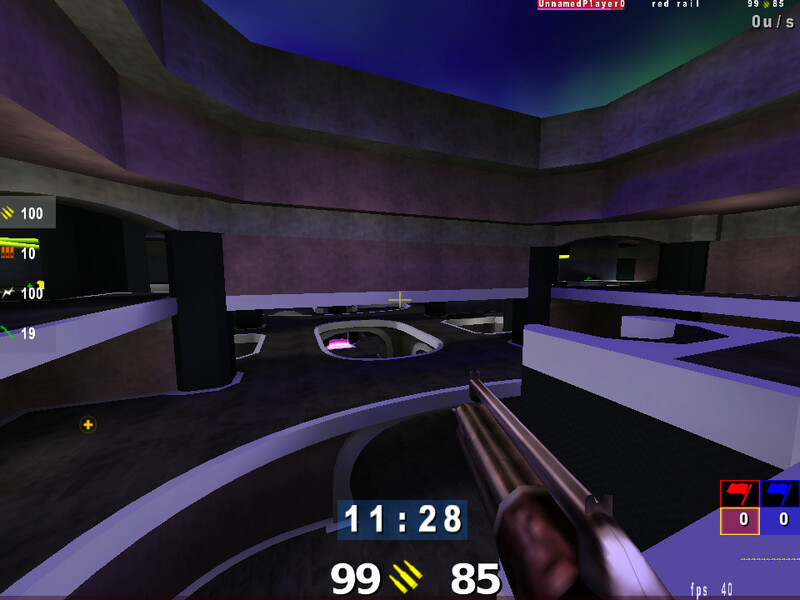 It runs a mod called failmod with some nice features in the beginning to enhance and make the casual pub baseOA CTF gameplay playable, but later - as it grew and temporarily resurrected the otherwise dead game as a sideeffect - received some competitive features too, to play higher quality games. The mod is based on version 0.8.1 (the one-and-only-true-version) of OA, running on a modded 0.8.8 engine, with a modded vm and an autodownloadable clientside vm, + equipped with a sophisticated featurerich adminscript. Note: /r_picmip value blurs the textures. The higher the value the more blur is applied. It can be benefical, as it removes the clutter: you can concentrate on the things you should concentrate on without the annoying sharp textures and it can even give you a couple of fps too. However it blurs rocket explosions lightning bolt and other objects that you don't want to blur, /cg_nomip comes to the rescue. IMPORTANT: Apply a /vid_restart every time you change either cg_nomip or r_picmip to take effect! Display yourself in teamoverlay with this one! Should be 0, the default as it only takes up valuable space, adds zero information but only confusion. You know your own health and position already. This one uses the same colors as the recommended /cg_drawFriend 3 but uses the max damage that specific teammate can take instead of raw health only. Example #1: If someone has 100 health and 70 armor the indicator will be blue because they can take 169 dmg before dying = virtual mega territory, hence blue. Old cg_drawFriend 3 behaviour would result in a white friend mark. Example #2: One has 20 health + 150 armor. With /cg_drawFriend 8 the friend indicator will be yellow because of virtual 20+40=60 health. Old /cg_drawFriend 3 is red. A setting of 2 colors each number based on its value. From 1-25 will be blue, 26 to 50 yellow, 51 to 80 orange, 81 and greater red. A setting of 3 is almost the same but uses white (as old plum 1) instead of blue because blue can be annoying and does not make too much sense anyway. These are not yet mentioned in cvars, but the older ones are well documented over there. Have a look! PUs dropped with /drop keep counting down preventing the possible abuse, PUs dropped by normal killing or any selfkill method still keep their remaining powers. Grabbing the flag gives two points as opposed to 3. - Callvotes work during timeout. - Restarting the map during a timeout informs the clients the timeout is over. Unsatisfied Big White Clock fetishist at genius will be satisfied by setting /cg_drawTimer 2 first, then by playing with hud_clockTAB cvars. Don't forget to use /seta and /writeconfig q3config.cfg! "Low ammo warning" text can be displaced with hud_ammowarningy. 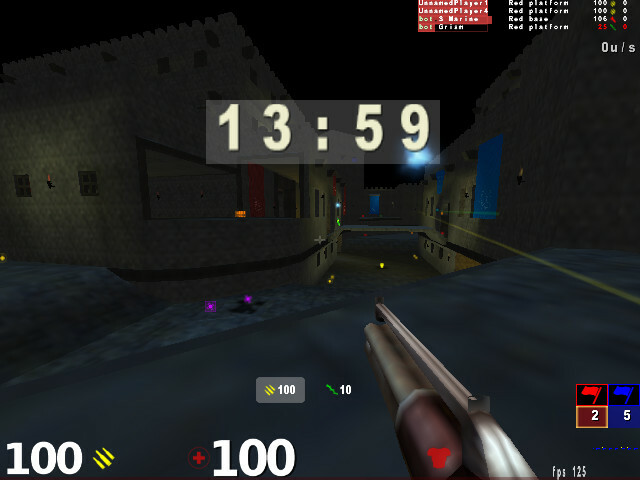 Interracial Clock lovers will be happy with hud_clockfg and hud_clockbg. UPDATE: Master server is back, order restored! Everything should be back to normal. Serverlist is empty and you don't know what to do!? You can try one of the solutions listed here! These methods work, but they take some time! Please be patient! EDIT: Alternatively you can try a quick fix (a so called hax! ), but it involves using the console and typing a command (ie: connect) with an argument (stupidctf.tk). Opening the console itself is a skill and depends on a lot of things, for example your keyboard layout. In worst case it might be performed using a keycombo (Pressing two keys simultaneously! SHIFT+Esc). The bottom line is: unfortunately the alternative solution is beyond the scope of the news section and requires its own page with screenshots and detailed instructions. ps: if you could figure this out, drop a :20003 at the end before you hit Enter! 2) Press SHIFT+Esc, a window will drop down with some text in it. 3) Type this VERY carefully! Doublecheck all the characters! Stupid and Insta also got the latest (033) update (force enemymodels, colors, crosshairs, etc. Don't forget to /cg_forcemodel 1 first!). If you don't change anything in your cfg, everything should look and feel the same as before. However if you played on a server before that already did set the same cvars added to 033 (or you copied cfgs across mods) you will see things have changed. You should be able to revert back to your old settings you got used to, or use the new cvars for a more personalized cfg. Enemy and team colors do not work in spec. Join! Read the news carefully, especially this one, check cvars! Callvote text and demorecording text overlaps: You can move either the cv one or the RECORDING one.